Pirates Press Services For Our Valued Customers! Pirates Press Services For Our Valued Customers! We manufacture the highest quality professional CDs and DVD's you'll find anywhere in the world. We manufacture them both in the United States as well as in Europe, and we work tirelessly with our suppliers to insure the most affordable pricing on all of our CD packages, and markedly superior products and service from beginning to end. Because of our relationship with our European vinyl facility and other resources gained through years of experience in the industry, we have the ability to greatly assist companies who end up doing a considerable amount of international shipping. All of our products can be manufactured and drop shipped anywhere in the world at a fraction of what it would cost to ship internationally after the initial distribution of your final product to you. If you ship even 5 or 10% of your product to Europe or Asia, Pirates Press can save you money. 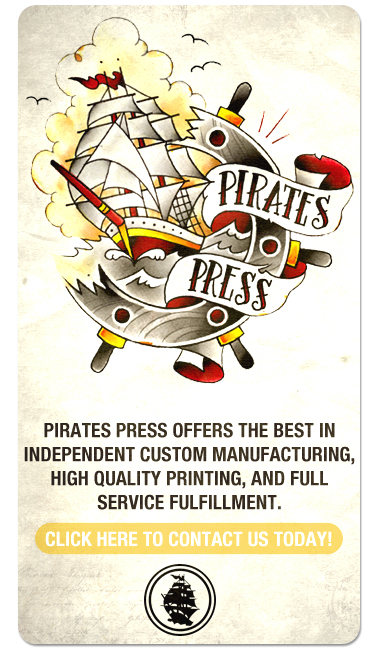 If you want to learn more about how Pirates Press can become your shipping manager, saving you time and money, please feel free to call or email. We have many affiliations with independent graphic designers nationwide specializing in various skills, styles, genres, and price ranges. Contact us for more info. We have relationships with recording and mastering solutions in various regions of the U.S. and Canada, specializing in different types of music and video production. We would love to help put you in touch with talented individuals and independent companies that can fill your specific individual production, recording, and mastering needs. Contact us for more directed advice.